Mom's Gone Bronson! : Build-A-Bear Hug-A-Cub Gift Set Review! Good evening!! It is almost 7pm as I type this review that I wasn't going to release until the morning, but I couldn't wait to share with you the most adorable thing I've seen in a long time, which I received in the mail just this week from Build-A-Bear Workshop, straight from their Hug-A-Cub collection! The guys over at Build-A-Bear sent me on over one of their gift sets [for my son, due in September], which comes jam-packed with a cute little green cuddly frog buddy, a rattle, a snuggler, a super-soft blanket and an adorable bag to keep it in, fully embroidered with his name, no less! This gift set is just one of a range of sets they have for the new baby, with several to choose from, including a white lamb, pink bunny, brown bear, the green frog and a blue puppy gift set, retailing for $49.00 and with up to 3 lines of embroidery for just $10 more, which means you can customize this adorable set for one specific little bundle in your life and have it as a keep-sake for years to come! For more on the gift sets, you can find them HERE, but there are so many more gifts suitable for baby [if you click on the "baby gifts" tab to the left], including the Sweet Velvet Teddy and Musical Lamb alongside several snugglers and rattles ranging in price from as little as just $5 each and, for those kind of prices, you can send a little token of love and appreciation any time of the year! I really can not wait to share this set with my son and to swaddle him in this blanket, which is softer than anything I could describe in words - but it is SOFT and then some! I know he will love all of the baby-safe pieces in the set, just as much as my daughter has adored every one of her bears in the past, and for a long time into the future! Just a wonderful, creative, keeper of a gift set and worth absolutely every penny! Have you had any experience with Build-A-Bear Workshop's baby gift sets (or general bears? ), let me know what you have and how much you and your children adore them!! I would love to hear from you! Head on over to Build-A-Bear Workshop to check out what's in store, today!! Enjoy!! Disclaimer: I was not monetarily compensated for this review, but I did receive the gift set for the integrity of the review itself. All opinions are honest and my own! Your opinions may vary! Thank you! Oh i love those super super cute!! want !!! 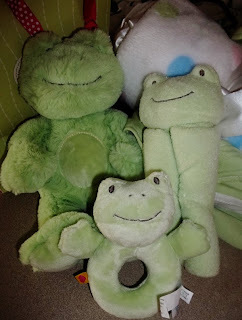 These are so cute, love the frog. I actually got one for my son which was the blue puppy. 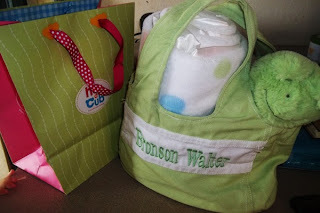 We honestly use the bag as a diaper bag currently and always carry the rest with us. He has slept in his blanket since day 1. Love your pics. love love love these! They are so cute! The perfect shower gift for sure! I have heard of Build a Bear, and my nephew would love one of these. They are so cute and cuddly and a perfect gift to give a child!